As we begin 2018, we’ve taken the time to identify the top marketing trends for the year. Apply these concepts to your business and start the new year on the right track. 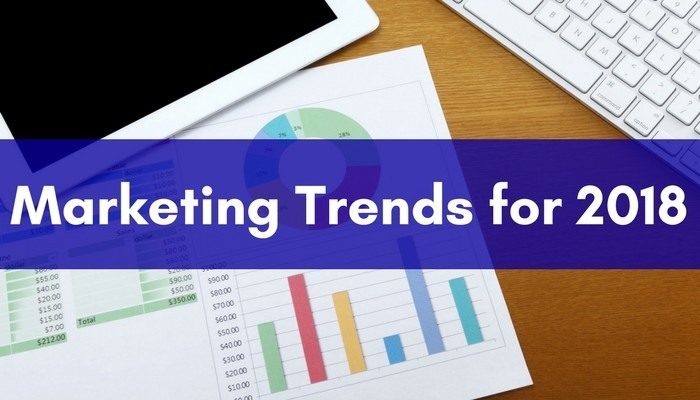 Properly applying these trends to your marketing strategy will improve customer engagement. You’ll also be able to acquire more customers this year. Let’s dive right in. These are the top marketing trends for 2018. Social media platforms paved the way for the live video trend. Instead of using social media for posting pictures and videos, you now have the ability to stream live content. If you weren’t using live video to interact with your customers in 2017, it needs to be a priority for you in 2018. Studies suggest 80% of consumers prefer watching a live video from a brand as opposed to reading a blog. And 67% of people are more likely to purchase a ticket to events like a concert after watching a live stream of a similar event. When businesses use live videos it gives them a chance to interact with their audience directly. You’ll be able to communicate and get feedback from customers in real time. Plus, it’s not like your live video is gone forever once you stop streaming. You can save those videos and repurpose that content in the future. Artificial intelligence will continue to rise throughout 2018. AI tools are used to analyze consumer behavior. Once the behavior is analyzed, these robots can make decisions according to how they are programmed. An example of AI you may be familiar with is a chatbot. These computer programs can have conversations with your customers. You’ve probably been on a website where a “customer service representative” popped up to start an instant message conversation with you. That’s an example of a chatbot. Now is the perfect time for you to educate yourself on the use of AI to improve different areas of your business. It will give you an edge over your competitors who aren’t prepared. You may be familiar with brand ambassadors and social influencers. These are people on social media who have relationships with companies and get paid to promote products on their personal profiles. It’s a legitimate marketing strategy. When it comes to social influencing, to be considered a celebrity, one has to have over 1 million followers. People with 500k–1 million followers and 100k–500k followers fall into the macro influencer and middle influencer categories, respectively. Micro influencers have between 1k–100k followers on social media. Brands are reaching out to these micro influencers because it’s easier for people to relate to them. Let’s be honest. Not many people can connect with celebrities. Plus, it’s obvious when they’re promoting something on their profiles. You may even have doubts that those celebrities use the products they’re pitching. But it’s much easier for the average person to relate to a micro influencer. Why? Well, for the most part, these people aren’t actually famous. They have normal jobs and live regular lives. But they happen to be popular on social media. If you’ve had any marketing success over the past few years, you’ve probably used content marketing strategies. Well, 2018 isn’t the year to take your foot off the gas pedal just yet. Content marketing is still trending upward. Compared to other factors, content marketing will have the biggest impact on companies in 2018, according to business executives. Rather than coming up with new content marketing strategies, refine your existing ones. Make sure your content is relevant and has a clearly defined audience. Content marketing is great because it’s typically not expensive. You’ll also see more sales and an increase in customer loyalty when you properly execute these strategies. Don’t think you need to focus all your energy on new trends, like artificial intelligence in 2018. Continue your content marketing efforts. It seems over the past several years, companies have been focusing on Millennials. There’s nothing wrong with that. It’s important to target consumers while they are young so you can try to retain them for as long as possible. Every generation has different buying habits. Millennials have helped shape the marketing trends over the last decade or so. But now it’s time to put some more emphasis on younger generations as well. Generation Z, also known as the iGeneration, Post-Millenials, or the Homeland Generation are people who were born in the late 1990s to mid-2000s. The oldest people in this generation are entering their early 20s. As they get ready to graduate from college, they’ll enter the workforce, which means their consumption habits will change. A steady job means they will have more buying power. Companies need to do more research on this generation and find out how to target them. It doesn’t matter what industry your company is in. Start to shift your focus toward Generation Z in 2018. Don’t abandon your approach with Millennials or Generation X, but just recognize there is a fresh market for you to target. You need to give your customers a personalized shopping experience. That’s one of the best ways to increase engagement and sales. It’s what your customers want. In fact, 75% of consumers prefer retailers that use personalization to improve their shopping experience. Encourage people to create a customer profile on your website or mobile application. That way, you can monitor their habits and give them special offers based on their browsing pattern or previous purchases. This is absolutely essential for companies who have an ecommerce website. Personalization tactics make it easier for you to upsell and cross-sell to your customers. Ultimately, this means you’ll make more money without spending much. It’s cheaper to target your current customers than it is to acquire new ones. You can also send personalized email messages to your subscribers. Email personalization can improve your conversion rates by 10% and increase click-through rates by 14%. If you personalize the subject line of an email, there is a 26% greater chance of the recipient opening it than if you don’t. In 2018, your company needs to focus on interactivity, especially when it comes to email marketing. Contrary to popular belief, email marketing is far from dead. But you can’t just keep sending out the same boring emails over and over again and expect to get different results. Interactive emails improve engagement with your subscribers. Staying up to date with the latest marketing trends is a recipe for success. The best marketers look toward the future to predict consumer behavior. If you can identify trends and make applicable changes to your marketing strategy, it will give you an edge over your competition. If you’re struggling to come up with new ideas, give us a call at 608-519-3070. We’d love to discuss how we can help grow your business in 2018.